I remember The Day The Music Died; I was a sophomore in high school. On February 3, 1959, I heard the news on the morning radio: Richie Valens, Buddy Holly and The Big Bopper had perished in a plane crash. Of course, The Music didn't really die. Because The Music consisted of a large galaxy with several pop giants (Elvis, Chuck Berry, Nat King Cole, Sinatra, etc.) and hundreds of very talented but smaller stars (Bobby Darin, Chuck Berry, Connie Francis, Lloyd Price, Frankie Avalon, Sam Cooke, Johnny Mathis, Bobby Rydell, Dion, Jackie Wilson, Brook Benton, Gene Pitney, Fats Domino, Brenda Lee, Roy Orbison, Ben E. King, Paul Anka, Gene McDaniels, Del Shannon, Bobby Lewis and many, many more). So, in March 2007, The Bopper's 48 year-old, 16 gauge steel Batesville crank-sealer casket (with slightly prow-shaped ends and low-slung handles - the closest thing in the '59 coffin world to a nosed-and-decked-and-lowered Jimmy Dean Mercury), sealed inside an inch-thick steel vault was unearthed, unsealed and opened. The forensic anthropologist who examined the remains reported that Richardson probably had died quickly from the massive injuries he suffered in the plane crash. No surprises. No evidence of any foul play. No smoking gun. Jay Richardson, the son, was present throughout the autopsy. When the casket lid was raised, it revealed a fairly well-preserved corpse dressed in a black suit and a blue-and-gray striped tie. The Bopper wore socks, but no shoes. (Hey, ya can't really bop with shoes on, baby!) The mottled, bluish face was slightly moldy and misshapen - perhaps by the shifting of mortician's putty used to reconstruct the crushed skull. The fingers had "mummified into curled, dark brown talons." But, remarkably, The Bopper's thick brown hair was reportedly "still perfectly coiffed in his familiar, 1950s flat-top." Jay, who apparently inherited his father's droll wit, remarked that the Big Bopper would never have chosen to be buried in such a tie. The Bopper was reinterred in a replacement casket donated by the Batesville Casket Co.** The new, Sapphire Blue box had that ubiquitous, anonymous shape of contemporary mass-produced metal burial containers. No low slung handles. No stylish prow-ends. Just straightforward, innocuous and slightly rounded - not unlike a contemporary Honda or Toyota minivan. Update (12-29-08): Here's the latest, courtesy of Ron Franscell of the Beaumont Enterprise: "Rock 'n' roll's most macabre historical artifact will go on the block when the family of the late 1950s pop star J.P. 'The Big Bopper' Richardson auctions his casket on eBay sometime in the next few weeks - almost 50 years after 'the day the music died.'" 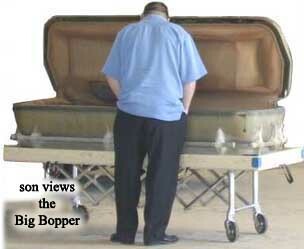 "The Big Bopper's 16-gauge steel casket was exhumed last year from his original grave at Forest Lawn Cemetery in Beaumont so it could be moved to a more visible location with a life-sized statue and historic marker." "Jay Richardson, the Bopper's son, plans to sell the empty casket on eBay to raise money for a musical show about his father and to keep the Bopper's memory alive. Born three months after the crash, Jay, who lives in Katy (TX), never met his father in life - but saw him for the first time at his exhumation." ** Another story involving Batesville caskets can be found here.